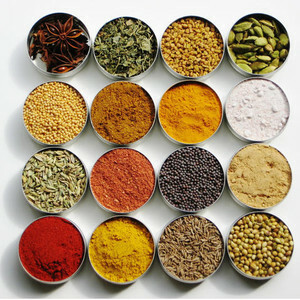 All five flavors are represented in this spice mixture. We can think of five good reasons for why this seasoning is on point... 1) Made from equal parts finely ground star anise, cinnamon, cloves, fennel seeds and Szechuan pepper. All five flavors are represented in this spice mixture. 2) Chinese five spice loans depth and complexity to dishes --- it holds a sweetness mixed with heat that yields a divine aroma when cooking. 3) This blend is often used with pork but can be a delicious seasoning for vegetarian offerings such as Chef Lupo's Faux "Pho" with Rice Noodles, Mung Bean Sprouts, Charred Carrots and Spring Onions. 4) All spices contained in this blend have varied medicinal qualities and health benefits. 5) Why enjoy just one spice when you can have five?! Star Anise, also called Chinese Anise, is not related to anise but has a similar flavor. The fruit of the Chinese magnolia tree, this spice helps with digestion and has also been known to treat rheumatism. Cinnamon is extracted from evergreen tree bark and is one of the oldest known spices (dating back as early as 2500 B.C. China!). Cinnamon is a spice of many talents acting as an anti-inflammatory and antiseptic. It contains cinnamaldehyde, a volatile oil that can work as a painkiller. Cinnamon can also lower high blood pressure, aid in digestion, and treat fatigue. Cloves are the buds of evergreen trees and are known for their sweet, strong aroma --- a little goes a long way for flavor! Cloves are an effective antiseptic and have acted for centuries as a natural breath freshener. Cloves are also used in Ayurvedics to help treat toothache. Fennel Seeds are similar in flavor to anise. Once utilized as a "cure for witchcraft," fennel seeds are now known to help with kidney stone treatment. They have long been used for multiple medicinal purposes by the Indian and Chinese. Szechuan Pepper, also called "Chinese coriander," is from dried red berries and has a very hot, spicy flavor with subtle citrus tones. Szechuan pepper is famous for its subtle, pleasant numbing of the tounge and lips. This spice aids in digestion and is also a good source of antioxidants. Alone these spices all have unique characteristics and flavors. Together, they are undeniably delicious and maybe even a little intoxicating and can make every cook seem like a total pro.